If you like to be a smooth operator, then it behooves you to listen to the dudes over at Fuel Injector Clinic, who have devised a way to provide your tuner with the data required to develop an idle that rivals that developed on the OE calibration level. What do we mean? Fuel Injector Clinic’s Data Match Technology, which takes the process of flowing injectors to the next level. “We match our injectors differently from any other company, we record and give the data in each box with each set, and they are serialized so we can track them. The tuner gets a basis to tune from using the OE data that we provide for all of the different ECUs from Dodge to Mitsubishi to Ford; we’ve even done some Lamborghini data. 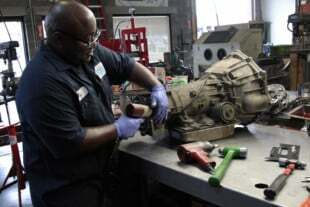 We understand the injector part of it very, very well,” says Fuel Injector Clinic’s Jens von Holten. This understanding carries over into the company’s philosophy, which is that each set of injectors must be matched as closely as possible with respect to both flow rate in cc/min and injector latency, which is the time the injector takes to fire once the electrical signal to do so is received. Latency is measured in microseconds, and is one of the critical parameters to ensure your tuner is able to set up your PCM to help your car idle smoothly in all situations. In fact, the company’s technology is so precise that it was enlisted by the NHRA to ensure that injectors used in Pro Stock competition are accurate. Jens explains more in the video below. But that’s not all. The company was also displaying their all-new secondary port injection system, which is designed for vehicles equipped with direct injection. It permits the user to add port injectors to a car that came with direct injection. “Typically, direct injection injectors have major limitations to what can be done for flow increase when performance improvements are desired. The injectors, pumps, and strategy have these limits to prevent effectively increasing the flow,” says von Holten. The point of this new system is to let a performance-enhanced engine run DI injectors during low pulse width operation, which will help in idle and low-demand situations, and then use the secondary port fuel injection system to supply fuel for high fuel demand situations typically seen when a power adder is used. The system uses all proprietary internals developed at Fuel Injector Clinic, and with the help of the external controller it intercepts the DI signal and runs independently of the factory ECU.